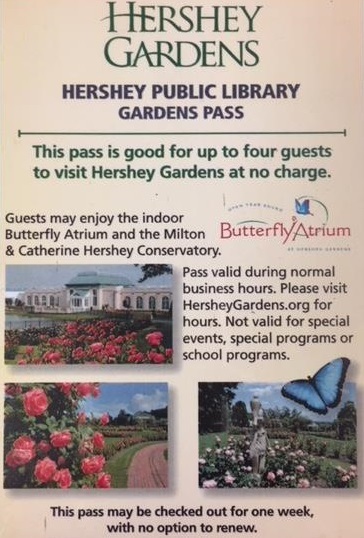 A pass is good for up to four guests to visit Hershey Gardens at no charge. Guests may enjoy the indoor Butterfly Atrium and the Milton & Catherine Hershey Conservatory. Checkout a pass with your library card. 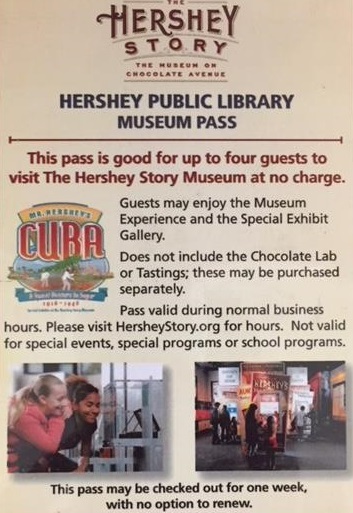 A pass is good for up to four guests to visit The Hershey Story Museum at no charge. Guests may enjoy the Museum Experience and the Special Exhibit Gallery. The pass does not include the Chocolate Lab or Tastings; these may be purchased separately. Checkout a pass with your library card.